The Early Childhood National Centers for Training and Technical Assistance (T/TA) promote excellence through high-quality, practical resources and approaches. They are designed to build early childhood program capacity and promote consistent practices across communities, states, Tribes, and territories. These Centers bring together the knowledge and skills from Head Start, child care, and our health partners across the U.S. Department of Health and Human Services (HHS). The Center for Early Childhood Mental Health Consultation, created through an Office of Head Start grant in October 2008, translates research in healthy mental development into materials tailored to the needs of its target audiences: mental health consultants, Head Start Program administrators, Head Start staff, and training and technical assistance providers. Its Web site provides a range of materials that address these audiences’ needs for effective ways to promote young children's social and emotional development and reduce challenging behaviors. Competencies: Early/Infant Childhood Mental Health Consultation is a resource developed to help supplement, extend, or guide existing or new efforts to build a qualified infant/early childhood mental health consultation workforce. Developing and Implementing a Programwide Vision for Effective Mental Health Consultation is a toolkit intended to support Head Start and Early Head Start administrators in their efforts to develop and implement a vision and strategic plan for a program-wide approach to mental health and mental health consultation. Five Action Steps to Address Maternal Depression in Head Start Programs provides information and resources related to five action steps programs can take to reduce the impact of depression in the families they serve. Social Emotional Tips for Families with Infants provides a set of five posters that families can refer to during specific daily routines. 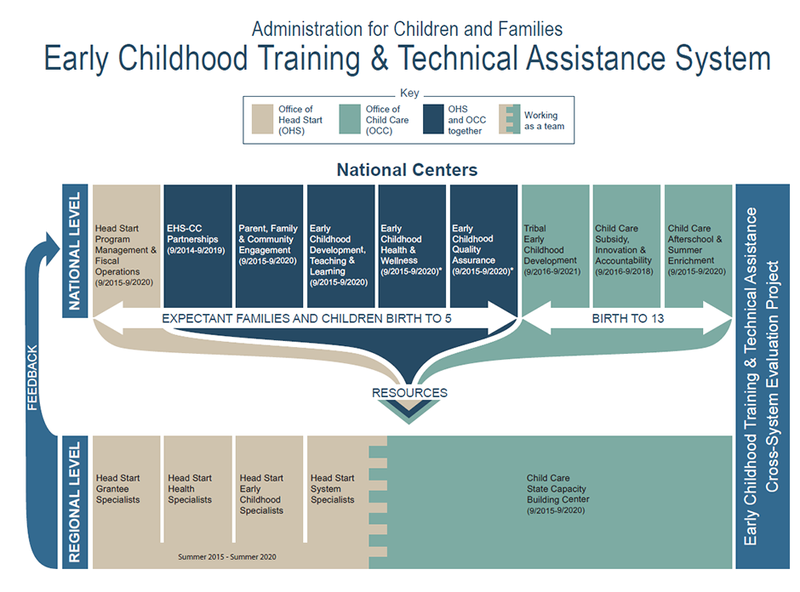 The For Training and Technical Assistance (T&TA) Providers page includes tools to help training and technical assistance providers assist Head Start programs; build capacity to support and sustain evidence-based strategies; and provide guidance and resources that can support high-quality mental health services and supports for children, families, and staff in Head Start programs. Tutorial 10: Cultural and Linguistic Competence in Early Childhood Mental Health Consultation is a tutorial intended to help early childhood mental health consultants understand what is meant by cultural and linguistic competence and recognize the preparation, skills, and practices that support effective service delivery within and across diverse cultures and communities. CEELO aims to strengthen state education agencies’ capacity to lead sustained improvements in early learning opportunities and outcomes. Topics addressed on CEELO’s Web site include teacher evaluation and financing. The site also includes contact information for state agencies. Building Capacity through an Early Education Leadership Academy was commissioned by CEELO as it began design of an Early Education Leadership Academy for state education agency and early learning agency administrators. The report concludes with a series of suggestions based on a multidimensional view of the leadership development needs of these early learning administrators. CEELO Annotated Bibliography: Using Technology in Early Childhood Classrooms provides resources and information about using technology in early education classrooms; and issues to consider when introducing new tools, media, and devices, so that educators and policymakers can make informed decisions about using such resources, and preparing teachers and care providers to do so. State of the States Policy Snapshot: State Pre-K Monitoring and Evaluation Policies is a brief that explains the importance of evaluation and monitoring systems for quality early education programs and systems. It also provides information on the types of data States collect. Data De-identification: An Overview of Basic Terms reviews the terminology used to describe data de-identification, as well as related concepts and approaches. It also provides information on best practices and strategies for different types of data and statistical techniques. The ABCs of Data Dictionaries is an overview of the basic components of a data dictionary. It is designed to educate and inform State staff about the benefits of having up-to-date data dictionaries for their data systems. The ELC TA mission is to provide and facilitate responsive, timely, and high-quality technical assistance to support successful implementation of Race to the Top–Early Learning Challenge (RTT-ELC) grantee state projects, and to provide cross-sector early learning resources to all States and Territories. The ELC TA Web site includes examples from RTT-ELC States that have worked to build comprehensive systems and resources focused on tiered quality rating and improvement systems (TQRISs), data, and assessment. The newsletter highlighting state examples may be particularly helpful. Note that this site has companion sites: ELC TA Central is the Communities360° hub for communities on TQRIS, developmental screening, sustainability, and comprehensive assessment. ELCTA webinars are available on a range of topics, including assessment systems, data systems, management, professional development, quality rating and improvement system standards, successful state systems, sustainability, and TQRIS. Scholarships for Early Childhood Educators in RTT-ELC States is a report prepared in response to an RTT-ELC request for information on scholarships for early childhood educators. In the report, 15 States describe the scholarships they award, who receives scholarships, and the funding or administration of the scholarships. TQRIS Validation: Summary of Resources contains a range of current resources on validation best practices, as well as state examples. Transformation Zones – an Early Learning Improvement Strategy was prepared in response to an RTT-ELC request. It is meant to inform States as they consider how to increase the quality of early learning by providing targeted resources to the communities where children and families with the highest needs live. The TA Center is dedicated to increasing the capacity of communities, States, Tribes, and Territories to improve, sustain, and expand systems of care and the services and supports provided within them. Its goal is to improve the lives of children, youth, and young adults with or at-risk of mental health challenges, as well as the lives of their families. The National TA Center webinar series consists of webinars that are held on the third Thursday of each month. This page houses recordings of past webinars. The Products and Publications page provides an alphabetical list of products and publications on varying topics. Toolkit for Expanding the System of Care Approach brings together resources developed to help expand and sustain systems of care throughout States, Tribes, Territories, and communities. Why Does This Still Upset Me? A Youth Guide to Understanding Trauma is a webinar that provides tips, strategies, and tools for making sense of our childhood experiences and using them as growth opportunities. The MIECHV TACC supports Health Resources and Services Administration grantees in implementing home visiting programs. The TACC brings extensive experience and a wealth of expertise in achieving high-quality program implementation, creating integrated service systems, and improving program outcomes. The General Resources page includes Web sites, research, articles, issue briefs, reports, and other resources on issues broadly associated with home visiting and improved child and family outcomes. The Training page consists of a list of on-demand webinars and conference calls addressing such topics as home visiting, implementation, system integration, workforce development, grant administration, sustainability and financing, and data systems and evaluation. Lessons Learned About Instruction from Inclusion of Students with Disabilities in College and Career Ready Assessment is a brief prepared to provide information and suggestions for state education agencies and other technical assistance providers who work with local education agencies. SiMR Tracking Sample: What Are the Advantages of Tracking a Sample Over Time? reviews approaches to and advantages of tracking a broader group of at-risk students over time. State Systemic Improvement Plan (SSIP) Evaluation Planning: A Companion Resource to OSEP’s SSIP Phase II Guidance Tool provides a series of questions to help States develop or review the completeness of the Phase II evaluation component of their Part B or Part C State Systemic Improvement Plan. The Webinars page includes recordings of National Center for Systemic Improvement webinars on a wide variety of topics. The ELC TA Program mission is to provide and facilitate responsive, timely, and high-quality TA to support the successful implementation of RTT-ELC grantee state projects, and provide cross-sector early learning resources to all states and territories. The Web site includes examples from RTT-ELC states about building comprehensive systems and resources focused on TQRIS, data, and assessment. The newsletter highlighting state examples may be particularly helpful. Note that this site has companion sites: ELC TA Central is the Communities360° hub for communities on TQRIS, Developmental Screening, Sustainability, and Comprehensive Assessment. School Readiness: Moving Toward a Shared Definition, Standardized Assessment, and Unifying Language describes the early care and education landscape and how States are addressing early care and education issues. The paper reviews key considerations in developing a statewide kindergarten entry assessment. Practical Outreach Guide for a Quality Rating and Improvement System offers practical advice to States about the development and implementation of a communications strategy to promote quality early learning and QRIS to providers, families, policymakers, and the public. ELCTA Webinars are available on a wide range of topics including assessment systems, data systems, management, professional development, QRIS standards, successful state systems, sustainability, and TQRIS. TQRIS Validation: Summary of Resources is a brief that contains a wide range of current resources about validation best practices, as well as state examples. Accessing Hard to Reach Families is a webinar with Deborah Watson, from Connecticut's Office of Early Childhood. Watson discusses her State's strategies for accessing hard-to-reach families. Five Numbers to Remember about Early Childhood Development is a brief that highlights the importance of early childhood to later development. Supporting Children with Families Living in Poverty in Rural Areas is a webinar on the unique needs of young children and families living in rural poverty. SLDS Technical Assistance provides resources on the successful design, development, implementation, and expansion of longitudinal data systems for kindergarten through 12th grade and early learning through the workforce. Everyone On Board: How to Engage Reluctant Stakeholders and Stakeholders Experiencing Leadership Transitions is an issue brief that explores methods to engage stakeholders, as well as strategies to overcome common impediments to stakeholder buy-in. Longitudinal Data Systems Share is a venue for sharing State-specific examples about various data systems topics, including access and privacy, data collection and storage, communication and stakeholder engagement, data use, governance, integration and exchange, project planning and management, sustainability, and system design. TACSEI uses research on practices that improve social-emotional outcomes for young children with, or at risk of, delays or disabilities to create free products and resources that help decisionmakers, caregivers, and service providers apply these best practices in the work they do every day. Family-Focused Interventions for Promoting Social-Emotional Development in Infants and Toddlers with or at Risk for Disabilities summarizes evidence related to promoting the social-emotional competence of all young children, and particularly to assessment and intervention for young children’s social-emotional challenges. Make and Take Workshops are workshops designed to provide information on a focused topic with the opportunity to make materials and take them back to the classroom. Practitioners who make materials to use are much more likely to implement the strategies in their classrooms. The Backpack Connection Series is a series of handouts created by TACSEI to provide a way for teachers, parents, and caregivers to work together to help young children develop social-emotional skills and reduce challenging behavior. The Publications page includes reports and briefs developed by the Center in response to state-identified needs. The Pyramid Model/EC-PBIS: Preventing Bias, Suspensions and expulsions in Early Childhood Settings is a webinar on how program-wide implementation of the Pyramid Model is used to ensure that all children, including those with persistent challenging behavior, are supported within programs without the use of expulsion or suspension. The ECTA Center provides technical assistance to state early intervention and early childhood special education services systems (Part C and Section 619) by improving systems, practices, and outcomes. A Guide to the Implementation Process: States, Steps and Activities explores effective, evidence-based practices and innovations using the framework of implementation science. The Outcomes Measurement page provides child and family outcomes-measurement tools for early intervention and early childhood special education for state and local administrators, technical assistance providers, teachers, and families. Enhancing Recognition of High-Quality, Functional IEP Goals is a training activity for early childhood special education staff. It is intended to support participants' understanding of the criteria needed to develop and write high-quality, participation-based individualized education program goals. Enhancing Recognition of High-Quality, Functional IFSP Outcomes is a training activity for infant and toddler service providers. It was created to support participants' understanding of the criteria needed to develop and write high-quality, participation-based individualized family service plan outcomes.